WASHINGTON, Aug 27 (Reuters) - U.S. airlines canceled more than 10,000 flights due to Hurricane Irene by late Saturday, while New York and other eastern cities initiated sweeping storm-related shutdowns of rail and mass transit systems. Tens of millions of air travelers, train passengers and subway and bus riders scrambled to adjust their routines, work commutes and vacations as transportation networks gradually scaled back operations. Coordinated transportation-related closures or slowdowns, often seen during winter storms in the Northeast, were mostly announced on Friday to try to give travelers enough time to adjust and ensure they stay away from Irene's fury. They were left to contemplate transportation service cuts lasting into Monday and possibly longer, depending on how hard Irene hits the Northeast on Sunday. New York's subway system, which carries 7 million riders daily and operates the largest fleet in the world, had never closed due to weather. "There is no mass transit available," said New York Mayor Michael Bloomberg, advising New Yorkers in evacuation zones who had not yet left where they could board special buses headed for safer locations. "The airports are basically all closed." 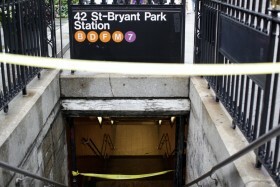 He said it was unlikely that subway and other mass transit operations would be up and running by Monday morning's commute. Airlines canceled more than 10,000 flights from Friday through Monday, according to the online flight tracking service Flightaware.com. The Northeast is the most congested area of U.S. air space and the three New York-area airports -- John F. Kennedy and LaGuardia airports in New York and Newark airport in New Jersey -- bore the brunt of East Coast cancellations. The three facilities handle about 6,000 flights on an average weekend day, and nearly 100 million domestic and international passengers annually. Disruptions in the region were felt across the country and overseas. The New York-area airports closed at noon EDT for arrivals and the last departures occurred in the early evening. Those airports were effectively closed and service would not resume until post-storm conditions were assessed, officials said. The virtually empty rain- and wind-swept tarmac at Reagan National in Washington handled sparse Saturday traffic, usually the lightest day of the week. The nation's capital was not expecting a head-on hit from the storm. Posted schedules showed flights only heading west to Detroit, Milwaukee and other cities. Reagan National, Washington Dulles, and Baltimore-Washington airports all planned to stay open through the storm even though airlines were halting service. Philadelphia International Airport closed until late Sunday afternoon at the earliest, a spokeswoman said. Airlines pulled out of there as well. Airports have backup generators that are usually reserved for maintaining power at air traffic towers and for public safety. But expectations were that Washington airports would be back in operation quickly. "If it goes through and is all over by late (Sunday) morning or early afternoon, things should get back on track," said Tara Hamilton, spokeswoman for Reagan National and Washington Dulles. As at New York airports, airlines moved jetliners to safer areas like Chicago and other Midwest airports. "We are not keeping any aircraft in Irene's path," said Andrea Huguely, a spokeswoman for American Airlines, a unit of AMR Corp.
Other carriers heavily affected include US Airways, Delta Air Lines, and United Airlines. The Federal Aviation Administration (FAA) said it worked to protect air traffic towers and other facilities and equipment from any storm damage. Despite the shutdown of regular service, some FAA controllers would remain at East Coast airports to handle any emergency, rescue or military flights. LaGuardia airport recently christened a new control tower that replaced a 40-year-old one that leaked. More than 1 million people evacuated the New Jersey shore areas via roads over a 24-hour period, the state's governor, Chris Christie, said. Christie sharply urged those remaining at Jersey Shore resorts on Friday to "get the hell off the beach" and leave the region to avoid the storm. A southbound stretch of nearly 100 miles (160 km) of the Garden State Parkway south of the Raritan River was closed, as was the Atlantic City Expressway, which heads to Philadelphia. Maryland closed the 180-foot-high Bay Bridge, which spans the Chesapeake Bay and links the Maryland and Delaware shore with the Washington region on Saturday night with gusts reaching 80 mph. Virginia had already closed the 20-mile Chesapeake Bay Bridge Tunnel further south. Authorities also planned speed and lane restrictions on the Delaware Memorial Bridge, a major north-south span on Interstate 95, and could order it closed if conditions warranted. New York authorities said they could close the George Washington Bridge, depending on Irene's winds. Other New York City suspension bridges could also close. New York harbor was emptied of ships. Airline travelers had few alternatives with Amtrak also scaling back Northeast rail service on Saturday and planning to shut it down on Sunday. Freight rail operator CSX curtailed local service in coastal North Carolina and Virginia and would resume operations "as conditions allow." CSX was inspecting tracks along the mid-Atlantic region. Locomotives, rail cars and crossing gates were secured ahead of the storm. Get up to minutes to minutes of real-time weather reports on the Hurricanes around the globe. Now MACTV has provided you a link where you can access important whether news on the net. Click the link below and allow the will of meteorology to become your daily forecasts. By selecting this link you will be able to follow Hurricane Irene as you move across the Easton coasts of the United States.